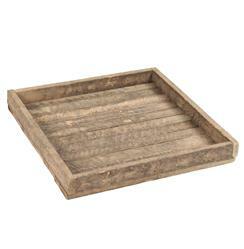 One of the best things about this reclaimed wooden tray is that you can carry it without fear– the raised sides won’t let anything slide. Load this workhorse up with plates of nachos and mugs of beer and transport it to your rustic lodge living room to watch the game. Or crudité and quinoa, to watch PBS. Either way, this beaut doesn’t judge. This item is made to order; please allow 6 - 8 weeks lead time for production.